While Albion may not be the epicenter of fine cuisine, there are plenty of hidden gems in the area. Whether you’re craving something casual and comforting like pizza or something a bit more cultured and flavorful, here is a list of my personal favorite restaurants that are no more than a half-hour drive from the heart of campus, any of which are sure to hit the spot when you’re in need of a break from Baldwin’s food. Opened in October of 2011 by Gina Pritchard, Gina’s has quickly made a name for itself in the Albion area. Just a short walk from campus, it’s the perfect place to go for filling comfort food (and a much more delicious alternative to Subway). While I’m a creature of habit and usually order the same thing every time I go (I’ve probably consumed close to a hundred of their turkey sandwiches by now), I’ve sampled enough of my friends’ food to know that the whole menu is delicious. Seriously, I’ve already started having panic attacks imagining the most horrific part of post-grad life being so far away from Gina’s. Be sure to like their Facebook page for daily specials and notifications about when occasional Chinese nights are taking place. Hours: Mon – Thur: 11 a.m. – 11 p.m., Fri – Sat: 11 a.m. – midnight, Sun: 11 a.m. – 8 p.m. Since 1909, Cascarelli’s has been providing the Albion community with pizza and beer aplenty! Cascarellil’s is usually the place I take any of my friends or family members who are visiting from out of town – it is, in my eyes, part of the classic Albion experience. Their breadsticks are unlike any I’ve eaten before (my brother, while visiting, called them “salty elephant ears,” which is, strangely enough, the most accurate description I’ve heard of them to date, although they taste much better than such a description would imply). Everything is made from scratch, from their pizza dough to their sauces, and that is evident by the deliciousness of the final product. On Wednesdays, Albion students provide live entertainment, and there is often jazz music on weekends. At first glance, you might not even realize that Little Red Lunch Box is indeed a café – it’s that small. But don’t let its unassuming size mislead you – what the building may lack in size, it more than makes up for in character. 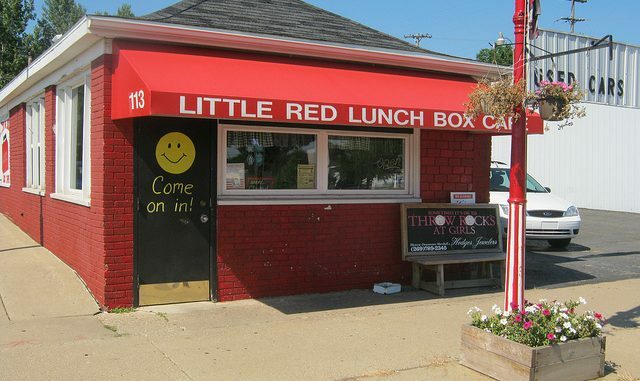 Little Red Lunch Box was the first restaurant I ate at as a new Albion student, nervous and timid. Within no time though, the owner, Sue (who you’re sure to meet should you stop in), had me laughing and chatting with other restaurant patrons, both Albion locals and students alike. It’s exactly that kind of warm, communal atmosphere that makes Little Red Lunch Box one of my favorites. La Casa is practically a rite of passage here at Albion. It is the place to be on your 21st birthday or whenever you have something worth celebrating (probably something to do with the reasonably-priced pitchers of margaritas). But whether you have a reason to celebrate or not, La Casa is always the right choice if you’re craving authentic Mexican food. From their guacamole to their Jalisco Special, and everything in between, you can be sure you won’t leave with an empty stomach (especially if you indulge in some fried ice cream at the end of your meal)! Hours: Mon – Fri: 6 a.m. – 9 p.m., Sat – Sun: 6 a.m. – 8 p.m. It took me a whole semester to discover Full Moon, but boy am I glad that I finally did. Situated behind a gas station, it looks more like an out-of-business Chinese restaurant than what it actually is: a damn delicious way to cure a hangover (the Farmers Platter with a side of chocolate chip pancakes being my personal favorite). The service isn’t always the speediest, especially during peak breakfast hours, but their reasonably priced meals and generous portions are certainly worth the wait – especially when all that you have to look forward to afterwards is a pile of homework you’ve been putting off all weekend. If you’re the kind of person who believes in the art of sandwich making, than Pastrami Joe’s is the place for you. At first glance, it’s difficult to tell whether the man depicted in Pastrami Joe’s logo is smiling or scowling, but by the end of your meal, you will certainly be convinced that he’s smiling, because the food’s that good. With a delicatessen vibe, Pastrami Joe’s is a lunchtime classic, and you can never go wrong with a sandwich, although they do offer pizzas as well. Hours: Mon – Thurs: noon – 11 p.m., Fri – Sat: noon – midnight, Sun: noon – 10 p.m. I knew I would love Dark Horse the moment I saw “Poop-a-Pepperoni” on the pizza menu, the description reading, “pizza sauce, a shitload of pepperoni, and mozzarella.” It is exactly that kind of quirky, sometimes brash, but ultimately endearing approach that makes Dark Horse one of my favorite places in the area. A great place to head to on a Friday or Saturday night, it’s the perfect place to unwind after a long week over pizza and beer because, let’s face it, pizza and beer with friends can solve just about anything. If you ever want to up your classy factor, just tell someone you’re going to dinner at One Five One. While it’s one of the more expensive restaurants featured on this list, it manages to remain welcoming and laid-back. And while you might not know every dish on the menu, there are at least a few familiar classics for the more cautious consumer. Hours: Mon – Thurs: 11 a.m. – 9:30 p.m., Fri: 11 a.m. – 10:30 p.m., Sat – Sun: 11 a.m. – 9:30 p.m.
I’ve always had a hard time understanding Klavon’s location (pretty much in the middle of nowhere), but have never had a problem understanding their pizza. They market their pizza as Chicago-style, but they should probably start calling it Jackson-style instead, because it’s so much better than any slice of pizza I’ve found in Chicago. Their sports bar chic atmosphere is the perfect middle ground for people looking for somewhere to watch the big game, but not be packed shoulder-to-shoulder next to drunken super fans. Hours: Mon – Fri: 11 a.m. – 11 p.m. (kitchen closes at 10 p.m.), Sat: noon – midnight (kitchen closes at 10 p.m.), Sun: 10 a.m. – 2 p.m.
Arcadia is famous (regionally, at least) for their beer, but their food deserves just as much praise. Situated in downtown Battle Creek, Arcadia has an eclectic, industrial feel to it, and it is the perfect kind of place to go with friends on a Friday or Saturday night, so long as you don’t mind the clamor of cookware and conversation. All their dishes are reasonably priced, but the appetizers and pizzas are the perfect size for splitting if you’re on a budget. Their beer list is also well worth a look for the over-21 crowd, especially their specialty seasonal brews. For an additional $5, you can also tour the actual brewery. Tess is a senior from Battle Creek, Mich., studying English literature and psychology. She is a member of the swimming and diving team, and is an avid burrito enthusiast. Follow her on twitter at @TessHaadsma. I was surprised to see that Zarzuela’s in Marshall wasn’t listed as an option. Within walking distance from the Bogar Theatre, Zarzuelas is a reasonably priced tapas bar with a fantastic range of dining options. I’m particularly fond of the dark chocolate orange cheesecake.